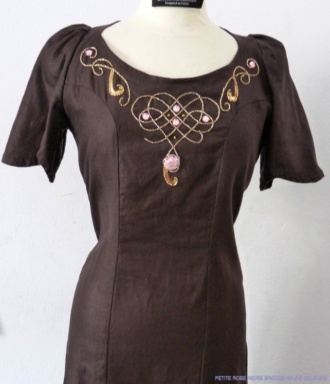 Little Chocolate Dress with shorts sleeves embroidered with a stylish Arabesque slow. 100% Wild Silk. Col Dancer - invisible back closure - 4 cm hem back 1 cm. 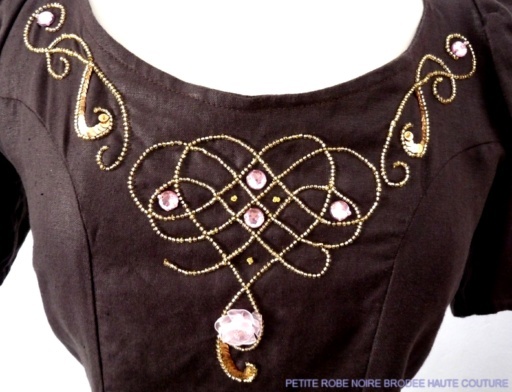 Lunéville embroidery: Laying Beads and Sequins. Embroidery in Aguille: Embroidery Ribbon and Broken. Be Careful ! the fabric of dresses in the photos is not specifically proposed that the catalog.